The south-Moravian region of the Czech Republic is a place where one could orbit, traveling and seeing for months and still not saturate the beauty of nature, vineyards and green hills, among which are spread dozens of castles . Another jewel in the crown is the castle fortresses Mikulov Castle, which stands beautifully over the town, long known for its high quality wines produced here. Mikulov Castle is situated on the border with Austria. Before entering the city will welcome you Austrin sea of wind turbines and the city will enchant you with its peaceful atmosphere of an essentially historical depth. Of course, the main culprit for this is Castle Mikulov. And while the central town square was built in Renaissance style, castle Mikulov is considered a creation of Baroque architecture. Unfortunately it is not authentic - it is built anew after its total destruction during World War II, but retains the face and structure of the original medieval fortress. The original castle was built in the late 13th century, but today parts of it are preserved only in the round tower, octagonal tower, chapel and a stone door. In the early 18 th century Mikulov was burned, and then in the years between 1719-1730 it was completely rebuilt and improved by the influential family Dietrichstein. During World War II Mikulov Castle is one of those historical monuments that were destroyed by land from the Nazi army. In the postwar years, the palace rises again like a phoenix from the ashes and in 1950 Mikulov Castle begins to function as a Regional History Museum. Today, the palace blends easily with modern history. It is equipped with everything necessary for carrying out various social events, balls, concerts, conventions, holiday festivals, major conferences, shows, presentations, etc. 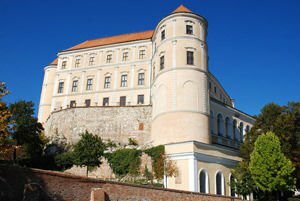 The museum of the Mikulov Castle can be seen the wonderful archaeological finds, exhibitions of paintings and arms, exhibits of traditional folk crafts and products of the wineries. Mikulov is a popular wine region, specialized in producing wine. For tourists, the city have developed a specialized routes program that includes events such as wine tasting, visiting the cellars of wine, visits the museum of wine or so-called walking wine trails. They can be toured on foot or bicycle. In the wine cellar of Mikulov Castle can be seen a preserved barrel of 16 century, which claims to be the largest in Europe - the whole capacity of 101, 300 liters. Cellar of the castle itself is considered one of the largest wine stores in Central Europe. In the South Moravian Region, where Mikulov Castle is, you can visit many interesting historical sights. Among them are Milotice Castle, the Straznice Castle, Lednice Castle. It is part of complex Lednice - Valtice, which is part of World Heritage by UNESCO since 1996. It is located about 11 km from the castle of Mikulov. Vranov Castle, located 61 km from Mikulov, is a baroque jewel that must be visited.